Ralph Vatalaro’s first sailing experience was during a summer NROTC cruise when the XO’s daughter invited the Midshipmen for a day sail on the family Lightning. After that he was hooked—on sailing, that is. After doing his best impression of Ensign Pulver in His Majesty’s Navy, his sailing continued with a series of misadventures over the ensuing years: nearly colliding with a large buoy at night while at the helm in San Francisco Bay, running aground in front of a large power boat in Swan Creek entering Lake St. Clair, being hoisted to the top of the mast to retrieve a lost halyard after a MORC race at Bayview Yacht Club in Detroit. After moving to Arizona, his sailing adventures continued: being “found” by the Coast Guard in Lake Tahoe (their significant others reported them overdue—late for dinner), a holding tank almost overflowing in Avalon Harbor (had to make a hasty departure), powering their way through the mud in Knapp’s Narrows in the Chesapeake (wrong side of the channel? ), returning to port after his crew threatened mutiny if they continued in a squall to Antibes, and last, but not least, being dumped into Lake Pleasant at the leeward mark when the skipper turned before the spinnaker take down. After all of this fun, Ralph is looking forward to finding a boat and getting back into racing with the AYC this fall! If you’re a new member and have not been introduced through Compass Points, please send a brief write-up about you (and your family) to membership@arizonayachtclub.org. 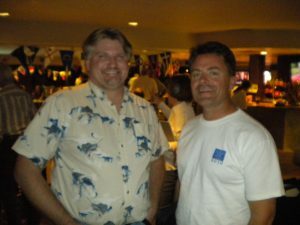 Dennis Davis took the Learn to Sail Right class with his brother in Fall 2011 and thinks ASF instructors are GREAT!! He is running two Lasers at TTL; Ema is currently taking High School Sailing. 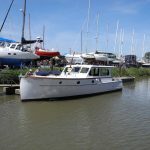 They are looking to add larger boats to the family fleet – maybe a buccaneer! The Edwards Family, Kevin, Stacy, Austin and Hollis, are long-time Scottsdale residents that pursue many outdoor activities. Kevin has been involved in sailing for many decades and has crewed on Team Gravity at Lake Pleasant for over six seasons. He crews with the “Shockwave” sailing team out of Long Beach, has been on many ocean excursions and continues to enjoy boating with friends and family. 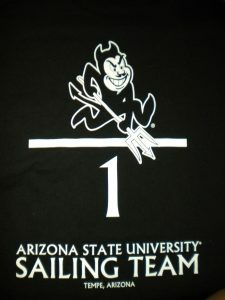 Austin, is a student at ASU and looks forward to participating in the sailboat racing program at Tempe Lake this spring. Stacy and Hollis both enjoy boating very much but have taken a more casual approach to their sailing experience. 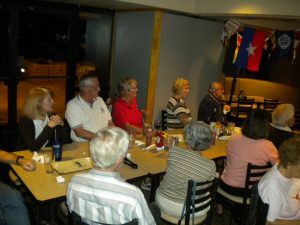 They look forward to being active members and getting know more of you at the Arizona Yacht Club. Chalz Kirubi is a mechanical engineer who has helped in building a 20-foot wooden Catboat called Kinship with his family in the Boston area. He has been on sailboats all 40 years of his life. He has lived in Phoenix for the past six years and owned a 22-foot Laguna Windrose that he would tow to Lake Pleasant. He is now looking to sail a bit more casually than owning by adopting a boat at Tempe Town Lake or crewing with others. Peter Lehrach taught himself to sail at age 13 on a Sunfish (the only boat he’s ever owned) and began racing competitively in college. He is experienced sport boat crew on J/22, J/29, & J/80s and raced extensively on a Pearson 30 in the Gulf of Mexico. As foredeck on a Farr 37, they won class at the 2003 Key West race week earning the crew an invitation to the National Offshore Championship at the US Naval Academy. The highlight of his sailing career was being #1 foredeck on a 70’ ketch for Antigua Race Week and then racing the same yacht in the America’s Cup Jubilee at the Isle of Wight, England. His cruising resume includes Marion (MA) to Bermuda, Newport to Ensenada, Turks & Caicos to Nassau, and bareboat charters from Guadeloupe, and the BVIs. 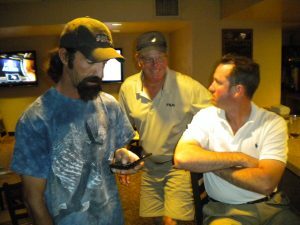 Court Roberts joined AYC in the fall and right away took the championship in the 2011 Governor’s Cup! He hails from Anthem and sails a Melges 24 and recently has begun sailing in the Laser fleet on Tempe Town Lake. Last year he began racing his Holder 20 in AYC Lake Pleasant races. Court originally grew up in Southern California where he starting sailing Sidney Sabots way back in the day as a kid. He spent many vacations sailing with his family to Catalina Island and other coastal cruising and often participated in the boat parade in Huntington Harbor. He moved with his family to Northern California in the late 70’s and picked sailing back up in the early 90’s. He owned and operated a night club and restaurant in Eureka, California for 15 years until the move in 2005 to Anthem; some of the summer months are still spent at his home in Northern California taking in the summer racing in the Humboldt Yacht Club, where he is also a member. Court says he is excited to be a member of the AYC and involved with such a great group of fine sailors who enjoy sailing just as much as he does. We look forward to his active racing involvement in Arizona. Devin Sloan became interested in sailing while completing the Deepwater Cruising course series at USC. While the course was geared towards offshore sailing in larger keelboats, it did include some experience with smaller boats such as 420s. He then helped crew in the Marina Del Rey beer can races for 2 years. Unfortunately due to work and relocation he has not been on the water for almost a decade and is looking to get back into sailing. He is interested in racing and assisting with equipment maintenance. Matthew and Jacob Thomas joined as Junior Members in the fall. They have participated in the High School Sailing Program. George and Pam Weaver have come full circle, having learned to sail in the early 70’s with an AYC member, racing on Lake Pleasant and participating in a cruise to Isla Tiburon off Hermosillo. 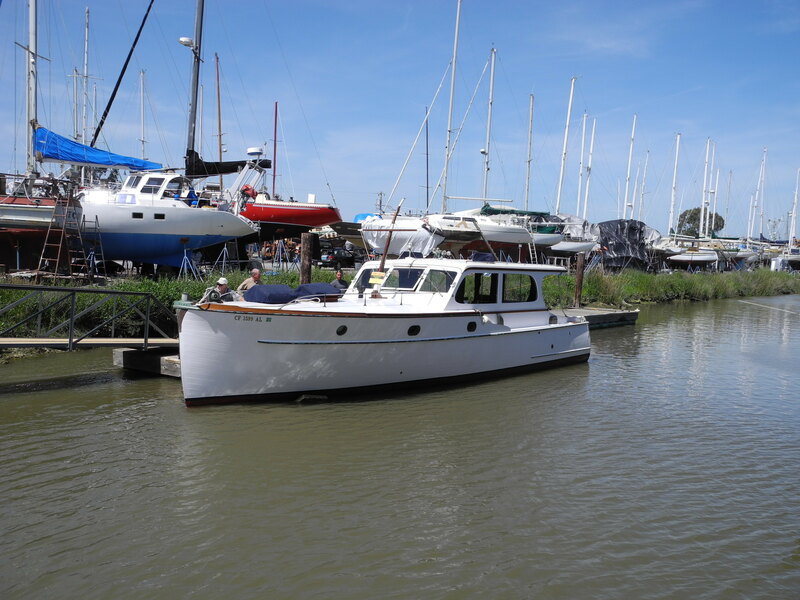 They have since sailed a variety of boats in the Chesapeake, San Diego Harbor, the Willamette & Columbia Rivers in Oregon, the Pacific Ocean off Honolulu, and the Pacific Northwest as proud owners of a 50’ Sea Ranger trawler. 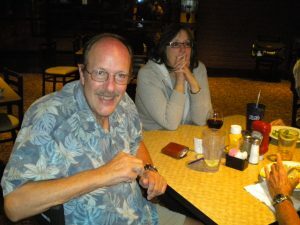 George is a retired Captain with Continental Airlines; Pam is an interior designer turned writer and is now the accomplished author of three books. 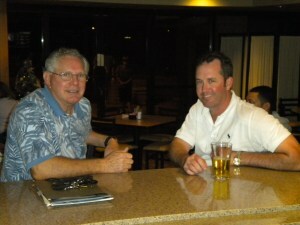 They live in Scottsdale with their Papillion Angel, an experienced watch-stander on the flybridge. The AYC Board of Directors has voted unanimously to name new Honorary Life Members, the club’s highest honor. The four new members of this special membership group are Al and Sandy Lehman, Mike Yarnell and Tia Renshaw. The four new members will be given special recognition at the Commodore’s Celebration on Saturday evening, May12. They’ll join two other current Honorary Life Members, Joyce Seale and Tom Ohlin. A great new “class” of members have joined AYC in recent months, from High Schoolers to Power Boaters (are we on our way to creating a “Power Squadron?”). Christina Andaloro joins us following a year with the Arizona Sailing Foundation High School Sailing Club. She is now a freshman in college, but started taking official lessons 6 years ago in Cape Cod MA. She looks forward to attaining instructor level certification and contributing to AYC through Club equipment maintenance, racing, and social activities. Shawn Cook took the SSR class and loved it. He is a Mesa resident, is a Laser sailor, and has been spending a lot of time down at the lake. 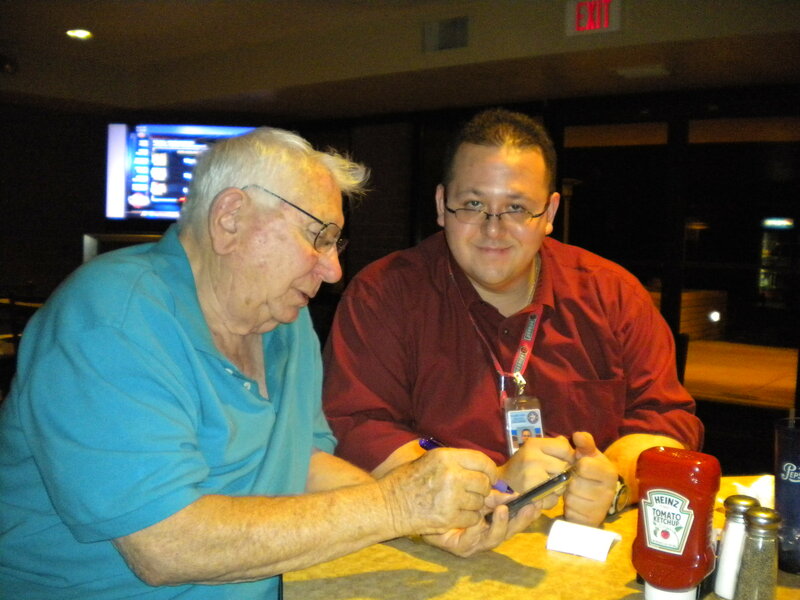 He is interested in Club equipment maintenance and assisting with racing activities. Luke Marino is a Freshman at Washington High School and has been sailing for about 5 years – most recently through the High School Sailing Club and before that racing in Opti’s. In the last 2 High School championships his boat was 2nd place! His dad also sails. He is continuing to take sailing classes, is interested in racing and cruising, and looks forward to achieving instructor level certification. 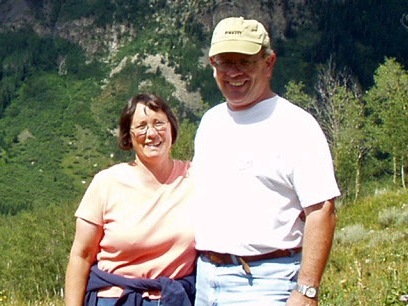 Mary and Jeff Miller: The Millers split their time between Scottsdale and the White Mountains. Mary is a long-time real estate broker in Snowflake, and Jeff works in Phoenix for APS four days a week. They’ve had a decades-long interest in sailing, having owned a very small sailboat in 1979, but only recently got a little more serious about the sport by traveling to Marina del Rey with two of their adult children to obtain a Basic Keelboat Certification in May of this year. They’re looking forward to gaining more experience and knowledge as time/schedules allow — hopefully with retirement figured in there somewhere! — and appreciate the opportunity to be part of this club. Cooper Miller: Cooper, 25, now has his ASA Basic Keelboat Certification and is looking forward to sailing involvement with AYC members, with a special interest in crewing for more experienced sailors. He recently graduated from the U of A in Mathematics with an emphasis in Probability and Statistics and is pursuing a new career even as he also splits his time between the White Mountains and Scottsdale, assisting with the family real estate business as a licensed agent. He’s a long-time snowboard instructor, as well, and welcomes any interested folks up to Sunrise Ski Park this winter! Cooper is also an avid mountain biker. 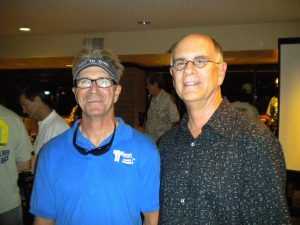 Jim Murphy, a Scottsdale resident, is interested in racing and in helping with AYC social events. Jim has been sailing “all his life.” And his son Garrison has taken the High School Sailing class. Randy, Tara, and Elliot Odman: The Odmans have extensive boating experience, but are new to sailing, thanks to the interest of son Elliot. Elliot sails in the high school program and just purchased his first boat, a sunfish, this winter. 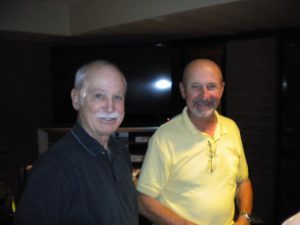 They are Mesa residents and interested in helping with new member support and racing. SPECIAL NOTICE OF MEMBERS WHO HAVE NOT RENEWED FOR 2011-2012 Our records indicate the following members have not renewed for 2011-2012; please let us know if that is not the case. Otherwise, please renew as soon as possible (no later than August 31) in order to keep your membership active and be listed in the 2011-2012 AYC Roster. If you need help accessing your online account, please Click Here to visit the Membership Services Page. It’s that time again, June 1, 2011 is the first day of annual Membership Renewal period. Don’t wait till the last minute…CLICK HERE to register now, or if you need some help come on down to the June membership meeting and we’ll get you signed up there and then! Prefer to use the good old US Mail and a pen or pencil? Drop an email to one of our “Ace” Membership Directors and they’ll get you a hardcopy form to fill out and you can mail in your check. Time’s a waistin! Renew your membership today! Please welcome our newest members, Bob Hastings, John Healy, and Bernie Armstrong, to the club. Bob is a Tucson resident and recently took the ASA keelboat 101 class at Lake Pleasant. Bob is interested in crewing on keelboats at lake pleasant. So, if anyone needs crew, please give Bob a call. John recently moved to Phoenix from Ireland. Both he and his son Denis, who sailed in Ireland, are interested in sailing and racing and are anxious to get out on the water. John is also interested in helping the club with equipment maintenance. 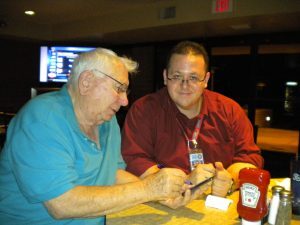 Several of us had the pleasure of meeting Bernie and his wife Judy at the last membership meeting. Bernie is a long-time sailor and currently sails an Enterprise, Hairy Carry. Bernie is interested in crewing, racing and helping the club with equipment maintenance. 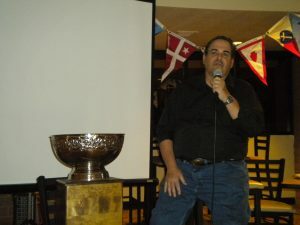 Also, we’ll get an update on the Birthday Regatta / Leukemia Cup from Greg Jackson, the Regatta Chairman. Remember – you don’t have to be a member to attend! If you need to know how to get there, Click Here!